Check out the pic. This is a great idea, and the reason I'm thinking this is worthy of its own thread because I've never seen another park offer something like this. It reminds me very much of those huge packages that Disney offers. You know - the ones where you get 50 buhzillion things included in the price that nobody could possibly take advantage of in the course of a single vacation. Still though, I'm sure many people end up dropping $100 for a day at this park anyway, so I can see why a lot of people with some extra cash to blow would go for it. Anyone seen this at other SF parks yet? We started touching on this in my SFGAdv TR thread, but you're right, it is worthy of it's own thread. I suppose it works like the free drink thing. I mean a park like HW pretty much made their only admission a $37 'package deal' that includes drinks rather than charging what similarly sized parks do and then selling drinks at 2 or 3 bucks a pop. This feels a lot like a similar 'package deal' admission. And I think you hit on a key thing there that I didn't verbalize very well, the park is locking that cash in no matter what the guest does in the park. I mean, even if you take advantage of most things you get and leave off 2 or 3 it's still a great deal. And if you somehow pack all of it into your day at the park - more power to yah. Not only will you be gaining my respect, but you're being kept busy WITHOUT WAITING IN THE LINES FOR THE COASTERS *and* with a full day like that, you're probably more likely to come back next year. I hadn't even thought about the coaster angle until I started typing this. With this sort of package you could probably cut your coaster riding time (and waiting time) by quite a bit for your average member of the GP and still have a great day. The first question that pops into my head is does the cost include Flash Pass Per Guest Fees? Standard or Gold? My question is this: What if you have a season pass? It says "Already have a ticket? Just $74.99!". So I'm assuming if you have a season pass it would be the $75, right? If so, I may take advantage of this sometime (it would certainly be much more enticing if the Flash Pass was gold). Also, I'm pretty sure they still offer the VIP package. For $100 you get 4 hours of "VIP access" to all the rides. Basically it's a 4 hour exit pass for every ride. 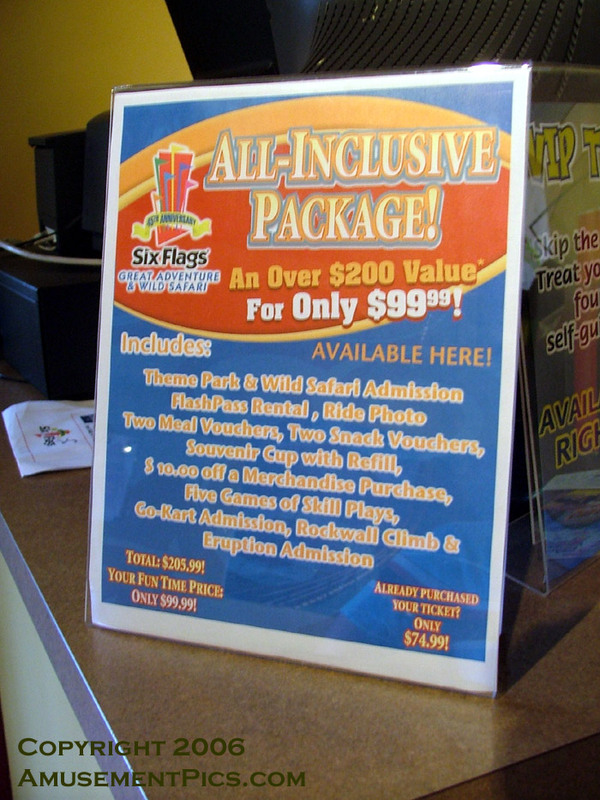 It might not be available anymore (it was last year), but I thought I remembered seeing the VIP signs in addition to the All-Inclusive Package. Cedar point has a plan kind of like this as well. $100 sounds like a good deal. $350 does not. Not even a little. I believe VIP offer of 4 hour exit pass access still exits. I believe I saw people using it when I went last wednesday and got my only lap on El Toro.